Few radiologists could imagine current clinical practice without CT. This powerful diagnostic tool’s ease of use and ubiquitous availability only fortify its significance. Nevertheless, traditional CT often still yields inconclusive findings that require supplemental testing to achieve a confident diagnosis. Philips IQon Spectral CT was created to address that challenge. Since its introduction, the IQon Spectral CT has had a profound effect on clinicians’ ability to detect and diagnose disease with a single exam, stratifying high energy and low energy photons simultaneously and using color to characterize the material content of critical structures. The ability to collimate by energy has elevated CT scanning beyond “tomodensity” to the new, yet predicted by Hounsfield himself, field of “tomochemistry.” By harnessing the advances in this technology, clinicians have taken CT to a whole new level of enabling diagnoses and, in some cases, making diagnoses faster. The Philips IQon Spectral CT provides a more complete picture of the patient with its ability to visualize cardiac abnormalities and lung capacity, which can be crucial to planning successful surgeries, such as transcatheter aortic valve replacement. Additionally, it permits a more comprehensive risk assessment using lower amounts of iodinated contrast. The patients receiving these types of treatments are typically older, often have comorbidities such as renal dysfunction, and are not amenable to routine open surgical procedures like an open sternotomy or aortic valve replacement, said Amit Gupta, MD, Cardiothoracic Radiologist at University Hospitals, Cleveland Medical Center, and Assistant Clinical Professor of Radiology, Case Western Reserve University School of Medicine. “For our high-risk patients needing valve replacement who may be poor candidates for open surgical procedures,” explained Dr. Gupta, “we can treat them by going through the femoral artery and placing the aortic valve endovascularly, rather than opening up that patient. That’s why reducing the contrast dose is so important. Instances of contrast dose extravasation also occur, though infrequently, and these patients will frequently need to be re-imaged, resulting in even more radiation exposure and a second dose of contrast. Chip Truwit, MD, Chief of Radiology at Hennepin County Medical Center (Hennepin), explained that he utilizes Philips IQon Mono-E spectral reconstruction in these cases. Dr. Gupta worked exclusively on clinical research before his facility received its clinical IQon Spectral CT in April 2016. Since then, he has replaced traditional CT with the IQon in a number of different protocols because of the benefits it provides. Hennepin was one of the first facilities to experience IQon Spectral CT when it was introduced, uniquely placing the unit in the Emergency Department (ED) and using its advanced diagnostic capabilities to help clinicians stabilize patients. When the opportunity arose, a second IQon Spectal CT was sited in Hennepin’s new ambulatory facility. The IQon Spectral CT has had a profound effect on diagnostic accuracy, said Drs. Gupta and Truwit, specifically in CT angiograms of the chest and aorta, where a true noncontrast image is followed by a contrast-enhanced image. 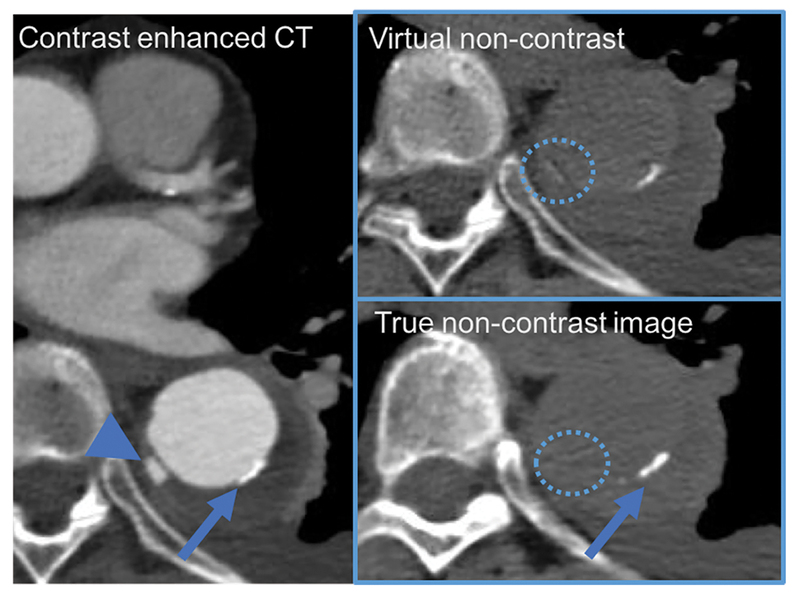 Using spectral CT, a virtual noncontrast image can effectively be created by subtracting the iodine from the contrast-enhanced image. Clinicians can confidently diagnose cardiac disease while also reducing the number of scans. As additional clinical uses for IQon spectral CT technology continue to be proven, even more patients may benefit from more accurate and more timely diagnoses, resulting in better patient care. Enhancing Diagnostics and Patient Care with Spectral CT. Appl Radiol.